In the wake of the outbreak of antibiotic-resistant Salmonella Heidelberg linked to Foster Farms in which at least 317 people were sickened in 20 states, consumer groups are calling on the U.S. Department of Agriculture (USDA) to strengthen its inspection program to prevent contaminated poultry products from being sold to consumers. In a letter to USDA Secretary Vilsack today, the groups question why USDA did not ask Foster Farms to issue a recall for its products. The groups note that the lack of a recall is especially troubling considering the number of people sickened by the outbreak, the high hospitalization rate, the antibiotic resistant strains of Salmonella, FSIS’ testing results in the implicated plants, and the fact that the outbreak remains ongoing. 1. 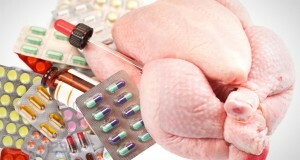 USDA should immediately declare antibiotic-resistant strains of Salmonella as adulterants. Antiobiotic-resistrant strains of Salmonella are a particular threat to human health because they are resistant to many of the drugs normally used to fight infection, which reduces the medical treatment options available, resulting in more severe disease outcomes. In 2011, the Center for Science in the Public Interest petitioned FSIS to declare certain antibiotic-resistant strains ofSalmonella, including the strain identified in this outbreak, as adulterants. This would allow the agency to condemn product that contained these pathogen strains. USDA should immediately grant the petition, and should include all poultry products and additional strains of Salmonella that have been linked to human illness. 2. The Food Safety and Inspection Service (FSIS) should immediately require poultry plants to review their food safety plans for Salmonella. According to FSIS documents, the Foster Farms plants implicated in the outbreak had not identified Salmonella as a hazard in their plants, despite the strong link between Salmonella and raw poultry. FSIS should immediately require all poultry plants to review their food safety (HACCP) plans to make sure they are adequately preventing Salmonella. 3. FSIS should assure that products linked to outbreaks are considered adulterated. In its outbreak investigation, FSIS was able to identify a genetic match between the outbreak strain and product in the plants, yet the agency did not request a recall of the contaminated product. FSIS policy must be clear that if the agency has a genetic match between the outbreak strain and product at a plant, the product would be considered adulterated and be recalled. 4. FSIS should seek authority from Congress for enforceable performance standards, mandatory recall authority and financial penalties. A 2001 court decision (Supreme Beef v USDA) hampered FSIS’ ability to shut a plant down for failing to meet federal standards for Salmonella. As a consequence, plants like Foster Farms can have a 25% positive rate for Salmonella (three times the current standard) and FSIS is unable to close the plant. In addition, recalls for meat and poultry are voluntary; FSIS does not have the authority to require a recall. Nor can the agency fine a company for not meeting safety requirements. In order to strengthen the agency’s authority, FSIS should ask Congress to provide it explicit authority to fully enforce its pathogen reduction performance standards, require companies to conduct a recall and levy financial penalties. 5. FSIS should set a standard for raw chicken parts. The current outbreak raises concerns about the extent of contamination on chicken parts, which consumers frequently purchase at the supermarket. FSIS estimates the national prevalence for chicken parts is 24.02% for Salmonella and 21.70% for Campylobacter. FSIS should set standards for raw chicken parts in order to reduce the prevalence of pathogens on these products. 6. FSIS should conduct baseline studies and set standards for incoming loads on poultry flocks. European countries like Denmark and Sweden have achieved reductions in human Salmonella illnesses by reducing pathogen levels in poultry flocks on the farm. While FSIS does not regulate on-farm activities, the agency should establish and enforce standards at slaughter establishments for incoming pathogen loads on poultry flocks to promote improvements on the farm. 7. FSIS should strengthen and clarify its policy on recalls and public health alerts and ensure consistent communication messages. Considering the severity of this outbreak with a hospitalization rate of 42%, FSIS messaging should tell consumers to discard or return Foster Farms chicken, not simply instruct consumers to cook the chicken adequately.